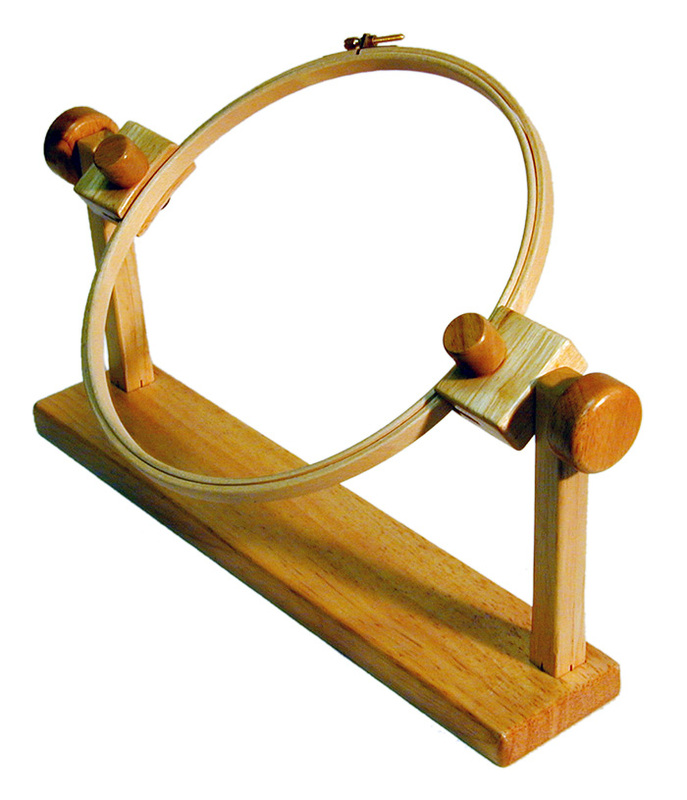 A hardwood, wide (13/16") round edged 10" frame mounted on a universal stand for using on a chair, with the base under your leg, or mounted on a table using a "C" clamp. 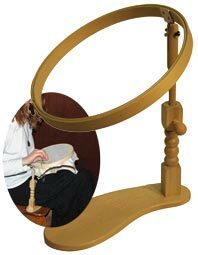 Adjustable height from 12" - 15.5". 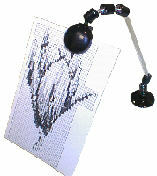 Frame easily flipped to view underside (MO03) $46.00 . 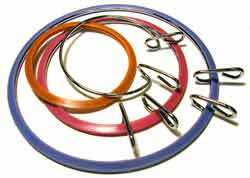 12" (MO26) $18.00 and 14" (MO27) $21.00 hoops can be ordered separately. 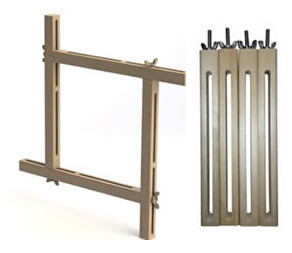 Fine quality hard wood, with round edges and brass screw. Available in 3" (RQ45) $2.50 , 4" (RQ21) $3.00 , 6" (RQ24) $5.00 ; 8" (RQ22) $7.00 ; and 10" (RQ23) $9.00 . This innovative design in stitcher frame incorporates a tackless mounting system, the fabric simply clamped beween the split rails. 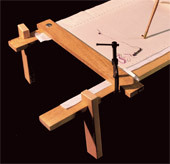 A self locking reversable ratchet system allows easy control of canvas tension. 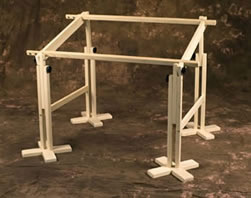 The spreader bars are easily adjusted to the exact width of ypu canvas for optimum support. Avbailable in 12" (FA20) $19.00 , 18" (FA21) $21.00 and 24" (FA22) $23.00 canvas size. 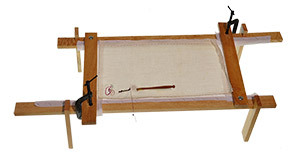 An heirloom frame and stand allowing 360 degree rotation of a 7/16" x 10" frame as well as allowing its easy insertion and removal. 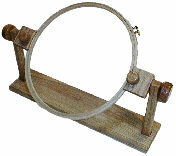 Stand is of finely finish solid Hardwood construction, with a round edge hoop (TS38) $31.00 . 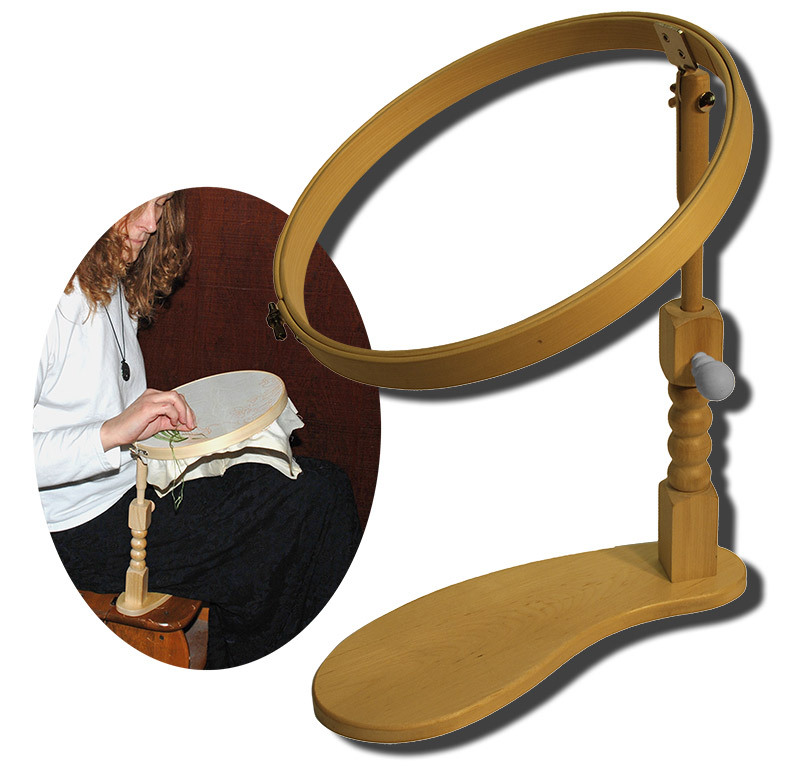 Can also be used with the Lacis "Sit-or-Stand" floor stand, item LF10. 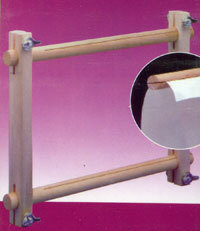 * Wood Dowell, 3/4" X 36"
* Wood Dowell, 3/4" X 48"